Ever hear of Humans of New York (HONY)? It's snippets of the stories of human beings in New York City and it gives me joy when it finds its way into my newsfeed. It's short compelling stories of individuals around New York City. From the moment I saw it I wondered how we could do the same thing for marketing Lutheran schools. How can we share the beauty and excellence of Lutheran education over social media? First, before you're overwhelmed by the time it might take, there are tools out there to help. Social media management tools will post it all for you when you need it done. The one I know many other church workers use is #1 on the list, HootSuite. Second, before you start posting away and if you are an employee of a Lutheran school, know your strengths. If you want to promote a rigorous curriculum, be sure you have a stronger, more effective curriculum than the schools in your area and be sure you can show why it's better. Don't just say it. Be able to prove it with comparable data and examples of work. Be familiar enough with your curriculum and that of your competition to be able to compare it to what the other schools are doing and show how it's stronger than what they are doing. Third, parents don't have to be a Christian or a Lutheran to want their children to have a great education. Parents who aren't looking for a Lutheran or Christian school are looking for an excellent school, and safe place for their children to learn that has a proven curriculum. Get them in the door for an excellent education and let the Holy Spirit do the rest..
Come up with a good tag! Check out a Lutheran School! 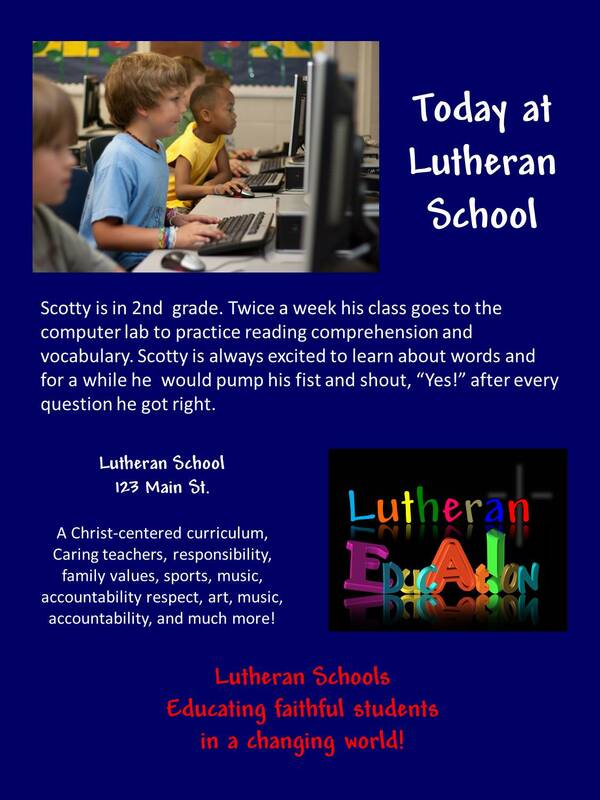 Lutheran Schools - An all around good idea! The positive side of education! We're not your public school! Far more than an education! 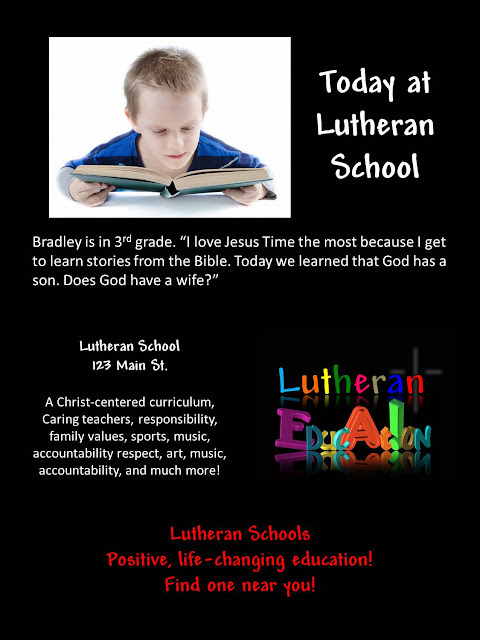 Start your day at a Lutheran School! Raising faithful students in a changing world. Have a clear, concise mission using phrases that appeal to those in and outside the church: In the spirit of Lutheran education students will learn to Live like a Friend, Love like a Servant, Learn like a Follower, Lead like a Guide. Along with "Christ Centered" and "Christian" use words or phrases like wholesome, family values, supportive, consistent, rigorous, challenging, family partners, encouraging, equipping, respect, relevant, genuine, guidance, mentors, etc. Let them know where you are located. 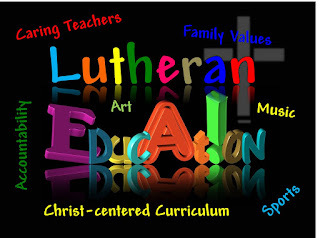 Many people don't know there's a Lutheran school in their neighborhood. Through questions and observation, write snippets from kids to share regularly online. Choose wisely and look for things like why they love their school, what they learned in class, why they like the book they're reading, etc. Little kids have trouble verbalizing when asked directly so you have to observe or ask teachers for quotes to share or stories about things that happened in class or on the playground. Only use photos you've been given permission to use online or for marketing purposes and get permission to use first names as well. Never use the last names of children. Once you've got your format down you can share it on Facebook, LinkedIn, tweet it on Twitter, put it on Instagram, etc. Here are a few of my examples (photos in public domain).